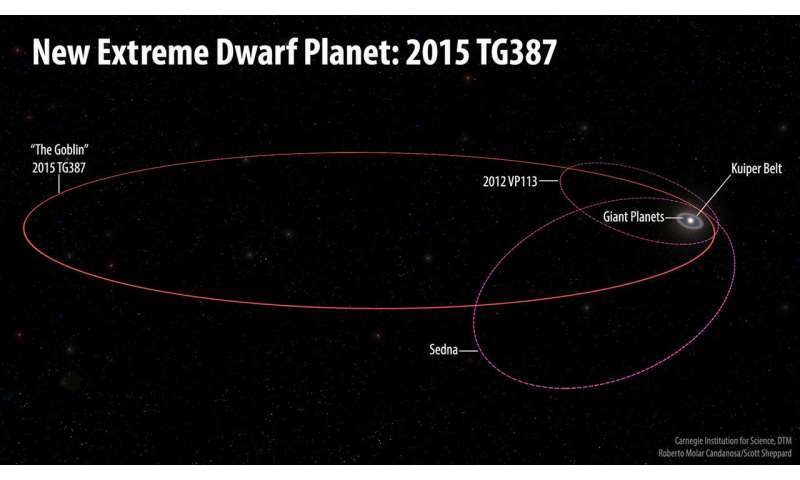 The orbits of the new extreme dwarf planet 2015 TG387 and its fellow Inner Oort Cloud objects 2012 VP113 and Sedna as compared with the rest of the Solar System. 2015 TG387 was nicknamed 'The Goblin' by the discoverers, as its provisional designation contains TG and the object was first seen near Halloween. 2015 TG387 has a larger semi-major axis than either 2012 VP113 or Sedna, which means it travels much further from the Sun at its most distant point in its orbit, which is around 2300 AU. Credit: Roberto Molar Candanosa and Scott Sheppard, courtesy of Carnegie Institution for Science. Carnegie's Scott Sheppard and his colleagues—Northern Arizona University's Chad Trujillo, and the University of Hawaii's David Tholen—are once again redefining our Solar System's edge. 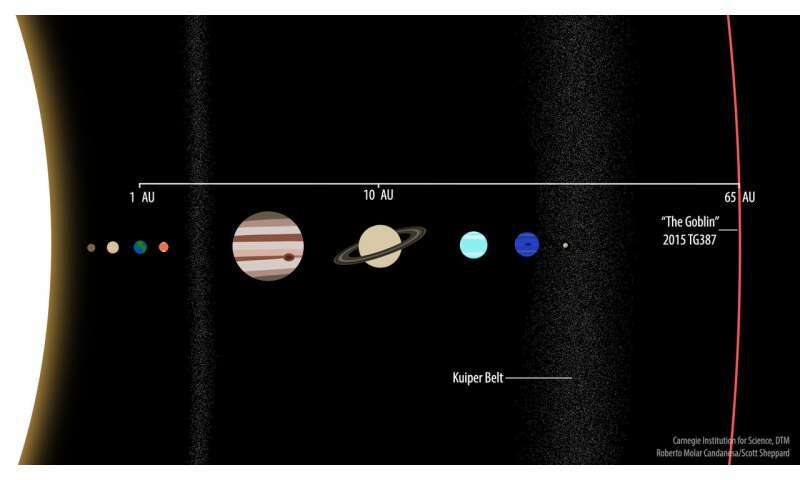 They discovered a new extremely distant object far beyond Pluto with an orbit that supports the presence of an even-farther-out, Super-Earth or larger Planet X. A comparison of 2015 TG387 at 65 AU with the Solar System's known planets. Saturn can be seen at 10 AU and Earth is, of course, at 1 AU, as the measurement is defined as the distance between the Sun and our home planet. Credit: Roberto Molar Candanosa and Scott Sheppard, courtesy of Carnegie Institution for Science. An artist's conception of a distant Solar System Planet X, which could be shaping the orbits of smaller extremely distant outer Solar System objects like 2015 TG387 discovered by a team of Carnegie's Scott Sheppard, Northern Arizona University's Chad Trujillo, and the University of Hawaii's David Tholen. Credit: Roberto Molar Candanosa and Scott Sheppard, courtesy of Carnegie Institution for Science. 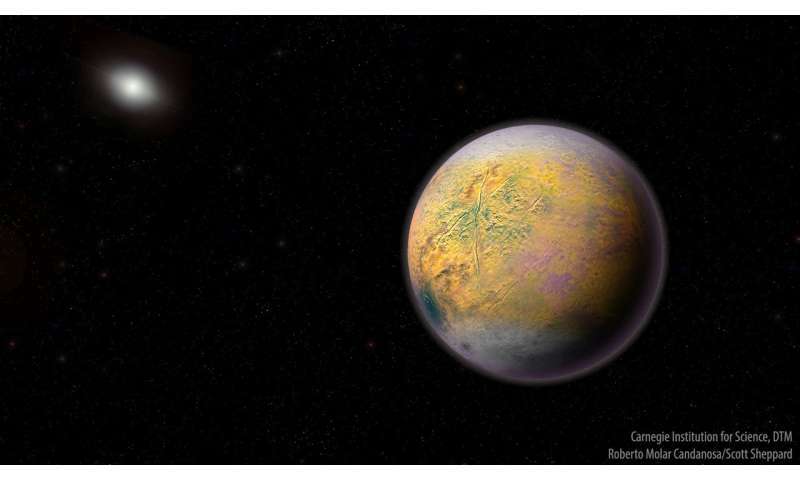 "These distant objects are like breadcrumbs leading us to Planet X. The more of them we can find, the better we can understand the outer Solar System and the possible planet that we think is shaping their orbits—a discovery that would redefine our knowledge of the Solar System's evolution," Sheppard added. Myself? I am not convinced that Planet X actually exists as we think of a small gas giants. Two wild speculations just now. What if the Planet X phenomena is a failed Neptune type. Kicked out of the early Solar System, possibly by Saturn or Uranus? Instead of Jupiter kicking it completely out of the system? Saturn could have shoved it out to the very edge but not forcibly enough to eject from our system? The even crazier imagining? That instead of what we would recognize as a planet? A body too small to see with our present technology. Yet very massive consisting of heavier metals (i.e. iron and higher elements) maybe even exotic elements. A remnant from an ancient hyper-nova for instance. That passed close enough to our System to collide with Neptune. Tough enough to survive the wreck but giving up enough cthomic momentum to result in a wobbly orbit past Pluto? Uh-huh. Or maybe it's a super-massive Space Gibbon. Having a super-long chthonic wobbly moment. In thpathe. Where nobody can hear you thqueam. The "Goblin"? What an ignoble appellation to give this distant body. There may be an institution where titles, names, appellations are decided upon - depending on who draws the shorter stick. Why don't you and rrwiliiejoe get together for some beers and fried chicken at the bus station of your choice. Just let me know so that I can be there with my movie camera, while disguised as Justin Trudeau. 300kilometers across and a 1% chance of seeing this thing on an orbit that brings it , coincidentally, to a visible place where it is about as close to earth (the sun) as it's going to get on its orbit. there are thus likely many countless objects smaller than this even closer, and probably counttless objects far bigger than 300k across that are far more distant. i don't know about a giant gas planet, but it could turn out there's far far far more reasonably sized planetismalls under 1000k across than anyone could every have thought. possibly tens of millions of them. That suggests it may be in a 8:1 orbital resonance with Vulcan. If so, future refinements of its orbit may approach 39792 years. oh, segue! You know the bus companies all have restraining orders against you , with or without a camera. Anywhere near their restrooms.